Woven rattan basket, Karen people, Thailand, approximately 9" x 14". 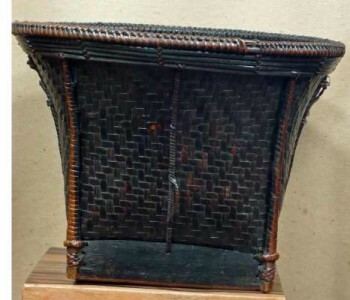 Description Handwoven rattan wood framed storage basket, Karen people, from the hill tribes area of northern Thailand, vintage, approximately 9" tall x 14" diameter. These basket are handcrfafted and vary slightly in shape, dimensions and patina.